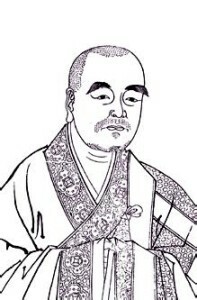 Our Dayan Qigong大雁氣功 Founder was born during the Eastern Jin Dynasty東晉時代 312-385. Dao An was not his family name, it was his Buddhist name. When you become a Buddhist, your Sifu will give you a Buddhist name, similar to a Christian who has a Christian name. We only know that his family name was Wei衛 and that his family came from Chang Shan County常山 in Hebei province河北省. He was born into an educated family, but his parents passed away early and so he grew up with his cousin Kong孔, who looked after him. Dao An was not born very good looking and he had a lump or cyst on his arm, and as a result, no one paid him much attention. However Dao An loved reading and he started to read when he was aged 7. He could remember every book he read and at the age of 12 he became a monk. During his first three years as a monk, his Sifu did not pay him much attention and just sent him to work in the fields. One day Dao An asked his Sifu if he could read a Buddhist Sutra, and so his Sifu gave him a book in the morning. Dao An spent all his spare time that day reading part of working on the field. The Sutra was five thousand words, even so, that night Dao An returned the Sutra to his Sifu and asked if he could read another one. His Sifu asked, “Did you finish this one?” Dao An replied that he had, but his Sifu did not believe him and so asked him questions about the Sutra. In reply Dao An could recite the Sutra off by heart and this really surprised his Sifu.